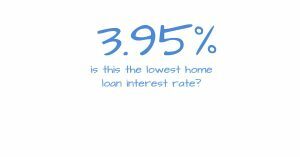 Are You Getting The Lowest Home Loan Interest Rate? It seems that the banks are at war on home loan interest rates and that’s a great thing for people who have a new home loan or one to to refix. On Friday we had ANZ start offering a special 1-year fixed rate of 3.95% which was reported as being reported as what it believes is the lowest mortgage rate from a “main New Zealand bank” in 70 years. Now we are having the other banks matching that rate. Most of the major banks have now matched this 1-year rate and even the smaller banks are being competitive. But is this going to be the lowest home loan interest rate? That is the question that nobody seems to have an answer for. What we do know is that the home loan interest rates are very low when compared to the interest rates that we are used to seeing. It was not that many years ago when we saw home loan rates at close to 10% and if you go back further (before my time as a borrower) my parents spoke of paying in excess of 20%. We all think we want to know that we are getting the lowest home loan rates. The fact of the matter is we cannot always get the lowest rate – and that has always been the case. It is tempting to fix our mortgage at the 1-year fixed rate of 3.95% but what we do not know is what the interest rates might be doing in a years time. My name is Stuart Wills and I have been a mortgage broker now for 20+ years so have seen interest rates change a lot. What I have learned is it’s better in most cases to have a strategy and sticking to it regardless of which banks are offering the best rates. Sure, you want to have competitive rates but you also do not want to be chasing the bank offering the lowest rate on any given day as that is costly and the best bank today may not be the best bank tomorrow. This is something that I recommend in most cases -splitting your lending into different loans with different fixed terms. Think about having about half of your lending fixed for 1-year and the other half fixed for 2-years and you will still be getting a low average home loan interest rate, but you are not putting all of your eggs in the same basket so are not relying on next years rates to be the best with the chosen bank. Most mortgage brokers offer free advice and are happy to help you arrange a suitable loan structure and ensure that you get competitive interest rates. Contact us today and we can help. The post Are You Getting The Lowest Home Loan Interest Rate? appeared first on The Mortgage Supply Company.